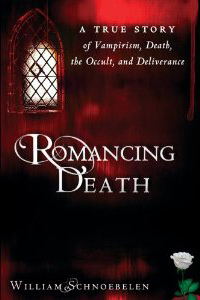 Bill’s new book, ROMANCING DEATH, sheds Biblical Light on today’s pop culture vampire phenomena. Anointed to reveal the truth on this topic vital to the Body of Messiah, Bill thoroughly exposes today’s romanticizing of vampirism and the occult and how it has overtaken much of society, even creeping into modern day churches to seduce young and old alike with fantasies of immortality, power and seduction through the drinking of human blood. This book dynamically exposes how millions have made soul ties to a shadowy darkness they cannot comprehend with devastating results – but then quickly moves on, revealing how the Church can and should equip itself to minister to these lost souls. HALLELUYAH! Providing an unshakable Biblical foundations to expose the evil of vampirism versus the gift of Eternal Life through Salvation, this new firebrand book weaves together Bill’s personal testimony (involvement in Wicca, Freemasonry and vampirism) and the literary and cultural histories of vampirism, while closely analyzing the romanticized ideals of the occult portrayed in the Twilight Saga series. ROMANCING DEATH is a clarion call and warrior handbook ­for the Church to take responsibility to be true salt and light in the world!